Enjoy your TV from every angle with this frost white, Full motion flat panel wall mount by Sonax. Customize your TV to the perfect viewing position with the adjustable distance settings of 12.5cm 51.5 cm from the wall. Designed to accommodate most 37-70 TVs up to 110lbs, this Full motion mount provides a +45 swivel and tilt options of -7/+15 up and down. Complete with a built in levelling system to expedite DIY installation and VESA mounting patterns up to 800x400 for big screen TVs The M-011-MPM is also available from Sonax in black as E-0312-MP. For a polished look pair this wall mount with your favourite Sonax TV or component stand. Maximize your living space with a low profile mount from the Sonax Wall Mount Collection. The E-5055-MP is a tilting flat panel wall mount designed to accommodate most 32-55 TVs up to 100 lbs. Tilt options of +10 / -15 allow you to adjust your TV to enjoy the perfect angle for your space while the built in levelling system helps expedite the installation. This discrete low profile design, also available in White as M-415-MPM, is the perfect solution to customize your home interior and compliment your new flat panel TV. For a polished look pair this wall mount with your favourite Sonax TV or component stand. Showcase your personal style with a frost white, low profile mount from the Sonax Wall Mount Collection. The M-415-MPM is a tilting flat panel wall mount designed to accommodate most 32-55 TVs up to 100 lbs. Tilt options of +10 / -15 allow you to adjust your TV to enjoy the perfect angle for your space while the built in levelling system helps expedite the installation. This discrete low profile design, available in Black as E-5055-MP, is the perfect solution to customize your home interior and compliment your new flat panel TV. For a polished look pair this wall mount with your favourite Sonax TV or component stand. TygerClaw LCD5003 give your TV the perfect spot in the wall with this Full Motion Wall Mount. This mount is constructed with cold steel material to maximize the durability and support, this wall mount can extend, tilt, and swivel your screen so you'll always can find the perfect viewing angle. This mount was built to give options for TV from 23 in. to 37 in. with weighing up to 55 lb. and articulated arm allows movement of TV up to 425 mm from wall, also an innovative locking mechanism gives quick and easy installation. This mount is the best solution for mounting TV on the wall without any hesitation. TygerClaw LCD3427BLK give your TV the perfect spot in the wall with this Full Motion Wall Mount. This mount is constructed with cold steel material to maximize the durability and support, this wall mount can extend, tilt, and swivel your screen so you'll always can find the perfect viewing angle. This mount was built to give options for TV from 37 in. to 70 in. with weighing up to 99 lb. and articulated arm allows movement of TV up to 53 mm from wall, also an innovative locking mechanism gives quick and easy installation. This mount is the best solution for mounting TV on the wall without any hesitation. 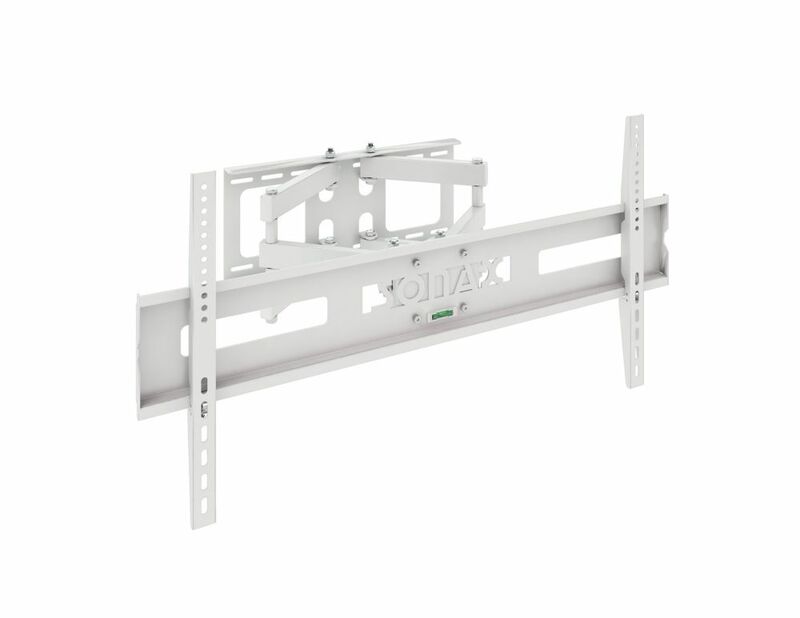 M-011-MPM Full Motion Flat Panel White Wall Mount for 37" - 70" TVs Enjoy your TV from every angle with this frost white, Full motion flat panel wall mount by Sonax. Customize your TV to the perfect viewing position with the adjustable distance settings of 12.5cm 51.5 cm from the wall. Designed to accommodate most 37-70 TVs up to 110lbs, this Full motion mount provides a +45 swivel and tilt options of -7/+15 up and down. Complete with a built in levelling system to expedite DIY installation and VESA mounting patterns up to 800x400 for big screen TVs The M-011-MPM is also available from Sonax in black as E-0312-MP. For a polished look pair this wall mount with your favourite Sonax TV or component stand.